The plate gap in spiral heat exchanger flow channels is normally maintained by welded spacer studs. Stud patterns and sizes are customized per application. Our Type 1-DO sludge spiral heat exchangers for digester sludge heating or cooling are designed with no studs on the sludge side to minimize the risk of clogging. The spiral plate heat exchanger is made by rolling two long metal plates around a center core to form two concentric spiral flow passages, one for each fluid. The plate edges are welded shut so that each fluid stays within its own passage and there is no flow bypassing or intermixing. Channel plate width and spacing (gap between plates) are optimized for the specified duty, maximum heat transfer, and ease of access. The plate gap is maintained by welded spacer studs although some designs do not require them. 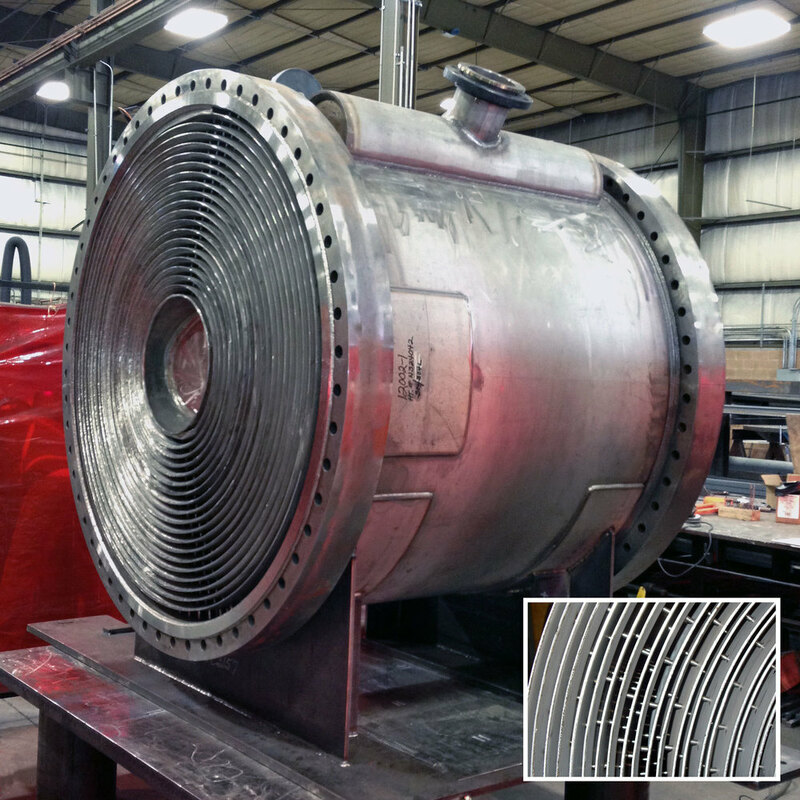 Due to its inherent circular design and large surface area to volume ratio, the spiral heat exchanger offers unique advantages over other types of heat exchangers like the shell and tube. Single and long curving flow passages with a uniform rectangular cross-section ensure superior flow distribution, intense turbulence, and high heat transfer coefficients (50-100% greater than shell & tubes). The spiral's single-flow passages induce high shear rates that scrub away deposits as they form. This self-cleaning effect reduces fouling and makes spiral heat exchangers ideal for handling tough fluids such as process slurries, sludge, and media with suspended solids or fibers. Spiral heat exchangers normally operate in true countercurrent flow for close approaches and temperature crosses. Occasionally a co-current flow design has major benefits, especially in cooling or heating fluids prone to gelation, burn-on, freezing or similar skin temperature related fouling. The spiral heat exchanger is compact and requires minimal space for installation and servicing. Removable covers provide easy access to interior heat transfer surfaces for field inspections, routine maintenance, or manual cleaning if required.